Sean Gilliam's Albany-Colonie Diamond Dogs pulled out the win on this June 1996 night with no small thanks going to Gilliam himself. In the 11-8 victory over the Bangor Blue Ox, The Bangor Daily News wrote, Gilliam knocked in five, hitting two home runs. "This is probably the best day I've ever had," Gilliam told The Daily News afterward. "The ball is just jumping off my bat right now. This is the best season I've had, even going back to Little League." Gilliam, though, saved his best for almost his last. In his seventh season of professional baseball, Gilliam was last recorded as playing that year for independent Albany. In affiliated ball, Gilliam's best never got him past high-A. Gilliam's career began in 1989, taken by the Yankees in the 61st round of the draft, out of Florida A&M. Gilliam has also been known by the name Bo Gilliam. At Florida A&M, Gilliam also played football, scoring two touchdowns as a running back for the team in September 1988. With the Yankees, Gilliam started in the rookie Gulf Coast League, getting into 41 games, hitting .272. 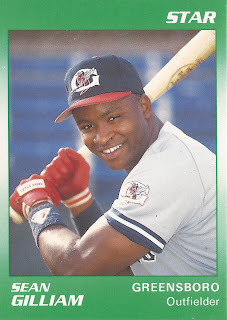 He moved to single-A Greensboro in 1990, hitting .200 over 131 games. Gilliam also hit nine home runs and stole 11 bases. He remained at Greensboro for 1991, improving his average to .262, hitting 11 home runs and stealing 20. In 1992, Gilliam moved to high-A Fort Lauderdale, hitting .220. With Fort Lauderdale in July, Gilliam knocked in four in one game, proving the difference in an 8-4 win. Gilliam played just one more year in affiliated ball, starting 1993 at Prince William with the Yankees, then moving to independent San Bernardino in the California League. He's not recorded as playing in 1994, but moved to independent Albany for 1995. He hit .327 in 68 games that year, his Diamond Dogs falling a game short of the league championship. In 1996, Albany returned to the championship series, Gilliam hitting .284 on the year. Gilliam told The Schenectady Sunday Gazette later that he almost didn't come back for 1996. But, after the 1996 championship, he was glad he did. It was also his last year in pro ball. "This is all worth coming back," Gilliam told The Sunday Gazette. "I had an empty feeling about last year. Winning the championship fills the gap. I was speechless last year. I'm speechless this time, but for a different reason, for joy."